Composed on New Year's Day, specially dedicated to my dear friend Zaha Hadid. Key Biscayne FL, January 2015. I had my first experience in meditation while I was a student in Cambridge, UK. It was so powerful that it changed my whole conception of music, from its creation to finding new ways of listening and being exposed to the experience and perception of sound. Sound on its own, away from the aesthetic concept. An equally important influence in my music is the use of the Golden Ratio (Fibonacci sequence) as the basis for the organic structure of my work. Soon I discovered the powerful effect of the spiral proportion on the brain and its ability to induce alpha waves, which we know as the blissful state of meditation. The concept of Soundscape Architecture was developed as a meditation on sound vibrating in harmony with its own space, and PRIVATE MUSIC was born with the desire of making a composition as unavailable as a work of art can be when is owned by a single person. "Returning to the fountain; that's how I would describe and define this wonderful masterpiece created by Maestro Eduardo Marturet. It's made me find a side of me that I had totally forgotten… Peace! “@ Zaha's place" a composition put together by Eduardo Marturet, transported my awareness to a level I have never experienced before. I was paintings an abstract for an exhibition when my husband put the music on. My feelings arose like waves each dancing to its own strength; reaching various heights but all returning to my heart in a rhythm perfectly balanced and marvellously beautiful. “@ Zaha's Place” is a precious gift. It carries the strength to mend a broken heart. It knows how to bring the body and soul in harmony. But it does more than that. It connects the outer world with the inner world and paves way for us to experience the true nature of our being “Joy"
"Composed as a gift for the home of world-renown architect Zaha Hadid, Marturet's “@ Zaha's Place" is a gentle musical invitation for us to experience our mind and spirit in privacy and peace. A must have... this is music to be cherished." "Eduardo, as usual, has created a mesmerizing and relaxing music. I have enjoyed very much.!! "This music has a really magical aspect and I have even used it to let the stereo playing in loop just to "clear the air" and bring good vibes." "@ Zaha's Place is a Sanctuary after a hard's work day. Totally recommend it." 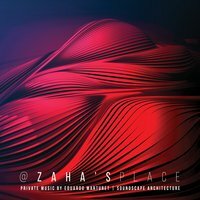 "Private Music @Zaha's Place, by Maestro Eduardo Marturet, is a journey of non invasive however permeable sounds, like gentle breeze swinging bells from a temple as ancient as the soul itself, that through calmness into positive feelings, creates an atmosphere of self confidence and focused thoughts."